I attached my first version of a plugin for controlling GOMPlayer. It's already fully functional, but i'll add more actions soon. Do you have a SourceForge user account? Then I can add you to the project members, so you can directly update your plugins through SVN. I have added you to the "Plugin Developer" board group, so you can now start support threads in the Plugin forum. I move this thread there now. Bitmonster wrote: Do you have a SourceForge user account? Then I can add you to the project members, so you can directly update your plugins through SVN. Thanks - my SF username is CHeitkamp. Hi! Can you please add Full Screen Streched (Keep Ratio) in GomPlayer (shortcut CTRL + ALT + Enter). 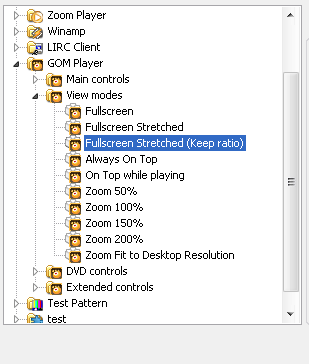 This option is very useful, for now there is only Full Screen Streched (CTRL + Enter). I don't know what to do with this *.py file. Branko84 wrote: Hi! Can you please add Full Screen Streched (Keep Ratio) in GomPlayer (shortcut CTRL + ALT + Enter). Only works with last actived window GOM player. Pause and minimize to taskbar/restores the window. Last edited by Somateri on Wed Oct 31, 2012 6:28 pm, edited 1 time in total. I have downloaded the newest version of GomPlayer (ver. 2.1.43) and I still don't have any result. Under View modes there are still just Fullscreen Stretched and Fullscreen. There is no Full screen Stretched (Keep Ratio)? I have downloaded the newest version of GomPlayer (ver. 2.1.43) and I still don't have any result. Yes, I have downloaded attached *.py file. I have erased all files in GOMPlayer directory (two of them) (C:\Program Files\EventGhost\plugins\GOMPlayer). When I again start EventGhost there is also *.pyc file which is autogenerated! Thank you for all advices you posted on this Forum! Thank U Somateri! There was my mistake! I have saved My remote settings.xml file with older version of *.py file (I did this because it was easier for me to load settings, than to set commands all over again after formating a hard disk). All I needed to do (in order to get ...(Keep Ratio) option) was to (now with your *.py file) add again GOM Plug in from the EventGhost menu!